Happy Thanksgiving to all of you in the US, and a belated Happy Thanksgiving to those of you in Canada. Tomorrow is just another normal school day for us here in France. We had our big November holiday on November 11. But the faculty at IFLE, the language school, are really cool and they understand that Thanksgiving is important to the Americans, so they have us make a big deal out of it. Tomorrow evening there is a big Thanksgiving dinner, planned, cooked, and served by the American students, with a Thanksgiving program to follow. I don’t know what my classmates have cooked up, but I am sure it will be good. Bekki and I get to help serve it. Friday night Vespers is a special Thanksgiving program also presented by the IFLE students. They asked me to speak for it (I was told to keep it short, so it is only about 10 minutes), so along with music in French and English will be my meditation thought in French. I have included the English translation of it below, because…drumroll please…they are supposed to be filming this and live streaming it on the internet so family and friends in the States and Canada can see it. It is supposed to be archived as well so you can watch it on a live tape delay, ie. at your leisure. The website is http://www.egliseducampus.org I checked it out, and don’t let the French intimidate you, there is a tab that says video, and that is exactly what it is a link to their videos. The program starts at 7:30 pm our time, so 1:30 pm east coast to 10:30 am west coast. Hope some of you get to see it. This was even before eating all the chocolate! 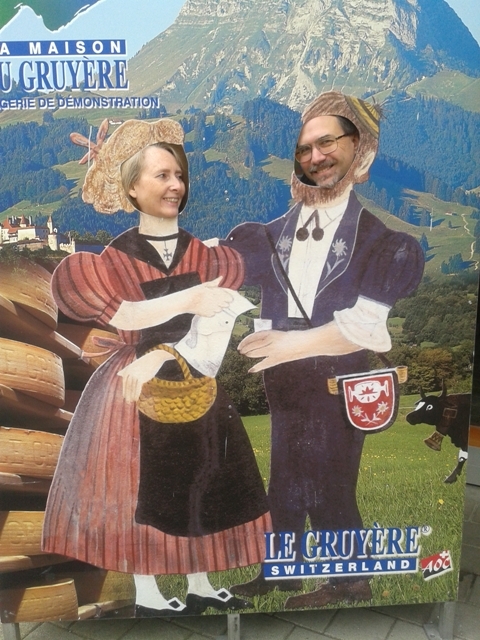 Ten days ago we got to visit Gruyère, Switzerland. Although you may not have heard of it before you probably have eaten some of their products. 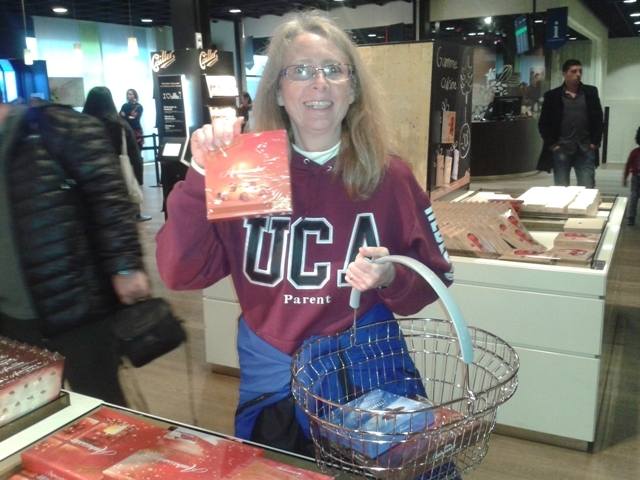 Gruyère is the home to Gruyère cheese, and you guessed it, the Cailler chocolate factory. Bekki was on cloud 63 (much higher than cloud 9). 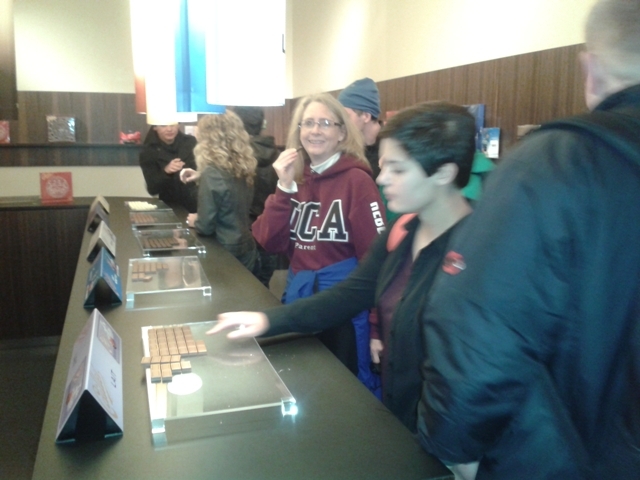 And, as promised, they have a room where you can literally eat all the chocolate you want, they have samples of every kind of chocolate they make. 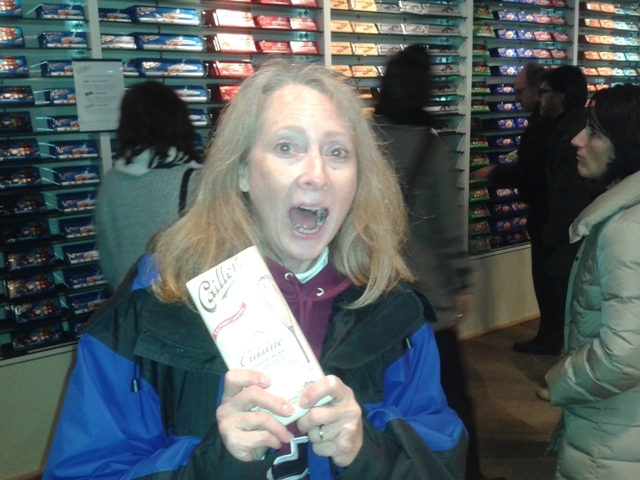 It was pretty cool, so I included a few pictures of Bekki at the chocolate factory as well. 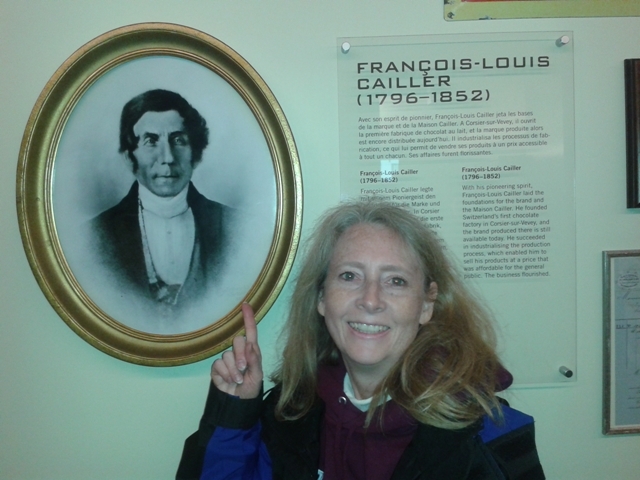 With her new historical hero, François-Louis Cailler. Like I said, all you can eat. We didn’t want chocolate for several hours after being in that room. It definitely put us in the mood for shopping. In the United States the Thanksgiving Holiday is very important for many reasons. It is the start of the Holiday Season, Thanksgiving, Christmas and New Years. Beginning with Thanksgiving and until just after the New Year there are lots of parties and social gatherings. It is also the time when families are together. There is lots of love and good feeling for all. Thanksgiving is a mobile holiday, that means that although it is always on the fourth Thursday of November, the date changes each year. The days around Thanksgiving are also the busiest travel days of the year for Americans. Around 40 million people will travel to be with their families this year. Thanksgiving is also the day preceding “Black Friday”. In the US Black Friday is the biggest sale day of the year. The day after Thanksgiving the big stores open their doors as early as 4 or 5 o’clock in the morning. There are lots of sales and people start lining up as early as 2 in the morning, or earlier. It is called Black Friday because it is the day the stores hope to turn their bottom line from red to black. Before Thanksgiving the children often perform plays. They wear costumes of the Pilgrims and Indians and present the story of the first Thanksgiving. Their parents are always very proud to see them on the stage. Each family has its own traditions. Sometimes a family will have a special project or a special game they play on Thanksgiving. Those that live in the country may go for a walk or bike ride, but the most important thing is that they are together. There are of course other popular traditions. There is always a special meal. Almost everyone has a roast turkey, or maybe a roast vegi-turkey. We often eat mashed potatoes, cranberry sauce, vegetables and pie, especially my favorite, pumpkin pie with whipped cream. And of course, football. Most guys watch the two games. There are two teams who play every Thanksgiving, the Dallas Cowboys, America’s Team, and the Detroit Lions. It is a grand tradition. One year, my wife, who doesn’t like football, told me, “If you are going to watch football, I am not going to work in the kitchen all day to prepare a fancy meal.” So she didn’t fix the vege-turkey, the mashed potatoes, the green beans. But my mother-in law, who loved me, still made my pumpkin pie. Anyway, Rebecca decided to order a pizza from Papa Murphy’s for dinner. It was an extra large with vegetables in the shape of a turkey. Since then we have had a new tradition in our home, The Thanksgiving Pizza. But the most important tradition has to do with what Thanksgiving means. That is to say, give thanks to God. So, before dinner we share together those things we are thankful for. We are grateful for our families, our children, our homes, our health, love, and life. And we always thank God for our Savior Jesus Christ, the Holy Spirit, His protection and His love. “Give thanks to the Lord, for His good. It is good to praise our Savior. Life, love, faith, and hope all come from God. It is good to recall all the blessings that God gives us. In the Bible also find these verses. Did you notice the words, “everything”, “always” and “in all circumstances” in these texts? Paul tells us to give thanks to God, but everything, always and in all circumstances. I think it is very easy to give thanks to God when things are going well. But it is very difficult to do this when things are not going well in our lives. How do I praise God when I cannot find a job? How do I praise God when I am sick, or my child or my spouse is ill? How do I praise God when I am alone, with no family? How do I praise God when I am hungry, thirsty and cold? But, Paul tells us, everything, always in all circumstances. Why? Because Paul knows a secret. He knows the secret to happiness. And the secret is not money, jobs, not even our health or family. I know lots of people who are very happy, and they have very little money, or no family or are ill. But, they are happy because they follow Paul’s counsel. They have the spirit of thanksgiving. This spirit is a gift from God. It is the secret of happiness. Even when all is bad in your life, you can still have the spirit of thanksgiving. In fact, it is when all is going badly in your life that it is most important to have this spirit of thanksgiving, because it will lift us up. When we praise God our nervous system releases neurotransmitters, adrenaline and serotonin and we feel better. Yes, when we remember all that God has done for us, we forget our pain. It is true! That is why Paul told us to “Rejoice always”. And if we forget to praise God and just pity ourselves, our life will be truly miserable. That is not true. Everyone has at least one reason to praise God. That reason is Jesus. Even if we have nothing, we can have Jesus. He will be our family, our friend, our life. And He promised eternal life with Him, for all those who accept it. That is the greatest gift. For those of you new to our blog, read about us and our upcoming mission to Africa in the “About Us” page, then there is a “Timeline” page that tells you where we will be this year, and finally a “Definitions” page that explains some terms that may be unfamiliar to some of you. Also check out the links to other Mission Hospitals to find other missionary blogs. I wanted to give you a follow-up as to what has happened in the last week with respect to our future. For those of you in a hurry, I will be brief. Nothing. You may go now. For the rest of you I will go into a bit more depth. At this point the West Africa Division, who along with the Central African Union, are my employers must decide whether it is worth the risk for us to go to Koza, and if not, where to send us. There are two other hospitals we could possibly go to, one in the Southeast of Cameroon in a town called Batouri, and the other in Tchad in a town called Moundou. 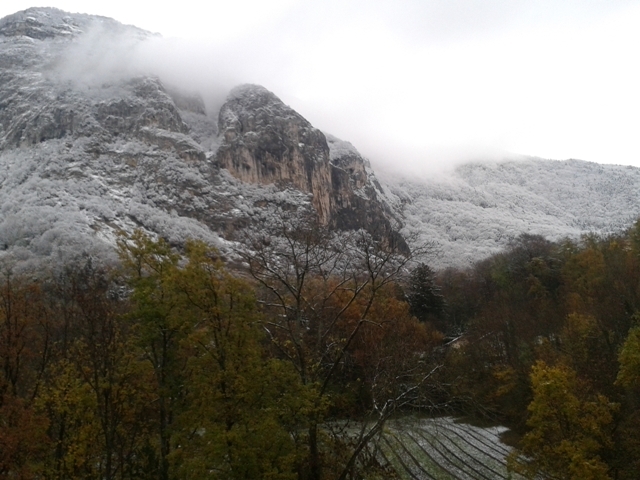 Moundou is about a two hour drive south of Bere where Olen and Danae Netteburg (our nephew and niece) are working. We do not know when that decision will be made, it could be this week, it could be after we arrive in Cameroun. We will of course keep you updated as soon as we know something. What I would like to share is how God has worked in our lives this week. As you can imagine this has been rather unsettling. First was the realization that it could easily have been us, and we are grateful that this has happened prior to our arrival. But it also drove home the fact that Africa is a dangerous place, not that there is a safe place anywhere, but Africa is particularly dangerous. Then came the questions, why, what, who, where, when. Why have we spent all this time, energy and money preparing to go to a place and then have it pulled out from under us at the last minute? Why can’t we have all the answers now? And, where will we go, what will we do, who will we be with? When will we find out the answers to these questions? And then of course there is the guilt and second guessing. Is it really that dangerous for us to go to Koza? Are we just being cowards? Don’t we have faith enough to go? So through last weekend and into the first part of the week we were pretty upset, lots of tears and lots of prayers. And we want you to know that we felt your prayers. We knew that all over the world we were being presented to the Throne of Grace, and we know that all of you would have given us hugs and love if you had been here with us. You will be happy to know that the people here in Collonges have done a great job taking your place. We have felt so much love and support the last week from our friends here. They have prayed with us, hugged us and well, just been there for us. So after much prayer and thought we have both found the peace that is beyond understanding, the peace that God gives, the peace that comes from knowing that no matter what happens, He is on His throne, and He is in ultimate control. We have determined that the time is now to walk the walk, put our money where our mouth is, etc. We do not know the best answers to all the questions, but God does, and we will wait for His answer. If after looking at all angles the church leadership decides they still need us in Koza, we will go. If they want us in Batouri, we will go, if they want us in Moundou, we will go. And we will do the best job we can wherever it is. Friday night at vespers the speaker made the comment, and more than one person told us they thought about us when he said it, “I would rather be in a dangerous place with Jesus, than in a safe place without Him.” We agree, and we have peace. This is easily the hardest blog post I have had to write to date, but we need to make all of you aware of our situation and ask for your prayers. Friday morning Bekki was told by the director of our language program that it was imperative that he speak with us immediately after class that day. This is like being called into the principal’s office. We were both trying to figure out what we had done wrong, we were failing, did they want more money, what? So right after class we went into his office. I have never seen him so serious. I wish it had been something like we were failing but unfortunately it wasn’t. Last Wednesday night at about 11 pm the Boko Haram, a terrorist group operating out of Northern Nigeria, next to Northern Cameroon kidnapped a French Catholic Priest from his parish house less than 10 km from Koza. In fact we drove by the mission on our way to Koza in February. The French government had been trying to get the priest to leave the area, but he refused. He was taken across the border into Nigeria where he is now a prisoner. This is very reminiscent of the kidnapping of the French family at the Waza Game Park last February. That little activity netted Boko Haram more than $3 million USD. 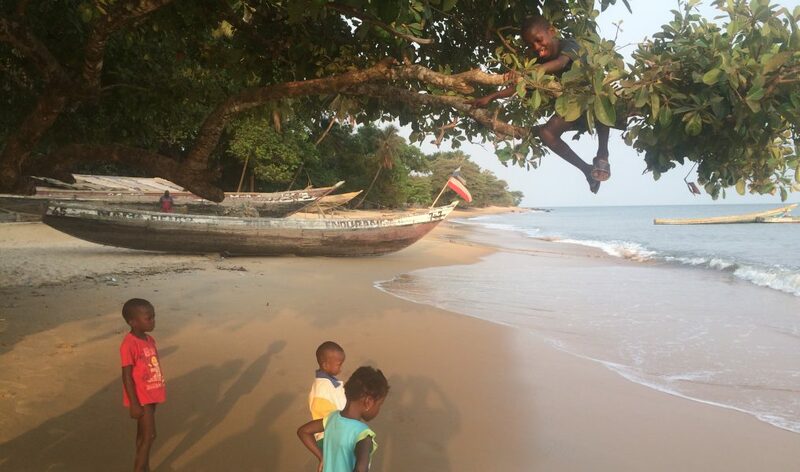 Most, if not all, Western governments have pulled their ex-patriots out of this area of Cameroon. Also on the day of the kidnapping the US State Department officially labeled Boko Haram as a terrorist organization. You have most likely not heard anything about this because it wasn’t until yesterday that anything showed up on CNN and that was buried, you have to look for it. We have gotten most of our information from the French Press and the BBC. Obviously this has a direct impact on our plans to go to Koza. It seems that we would be easy targets for Boko Haram, who have publicly stated they are targeting Westerners. And if we are living there full time it would be no problem to pop over and pick us up and take us back to Nigeria. That would be a problem for us, as well as the church and the US government. We also feel that it would put the hospital and its personnel at risk. Boko Haram has shown no mercy to Africans. If you wish to read about them and what they have been up to, be forewarned, it is not pretty, they are fully possessed by the devil as much as the demoniacs of Jesus’ day. So where does it leave us? I have already informed our Student Missionary that he is not going to Koza, and have warned Mike and Chris Kelly that should not go there either. I also pulled the priest of the family thing and told Bekki that she also wasn’t going to Koza. I have sent a lot of e-mails out to the General Conference, the West African Division and the Cameroon Union to alert them to the situation and to ask for guidance. So far what I have heard back (which is not much, since this is the weekend and since no one in the US even knows about it) is support for the moves we have made and also agreement that it is not in anyone’s interest to have us in Koza at this time. I have made it clear that we are committed to being missionaries, and we are committed to Africa. We are safe (and I appreciate those of you who were worried about that as you read this blog), and plan on staying that way. We are no help to anyone kidnapped or dead. But we do solicit your urgent prayers, specifically for the following things. Safety for the Koza Hospital staff, we may not being going there for now, but they are still in a very dangerous place. The safe return of this very dedicated priest, Father George Vandenbeusch, as well as the other French hostages still being held. Wisdom for the General Conference, the West African Division, and the Cameroon Union and us as we try to figure out where to go from here. That God will intervene and open the way for us to safely get up to Koza and be able to carry out His work there. The needs are so great. We cannot help but sense that we have really made the devil concerned for his territory, and so he is trying to interfere with God’s work. But we know that God is more powerful and can bring good out of any mischief the devil tries to pull. We ask all this in His name, and we ask that His will be done in all things. The last weekend of vacation we spent in Valence, just about an hour north of Avignon. 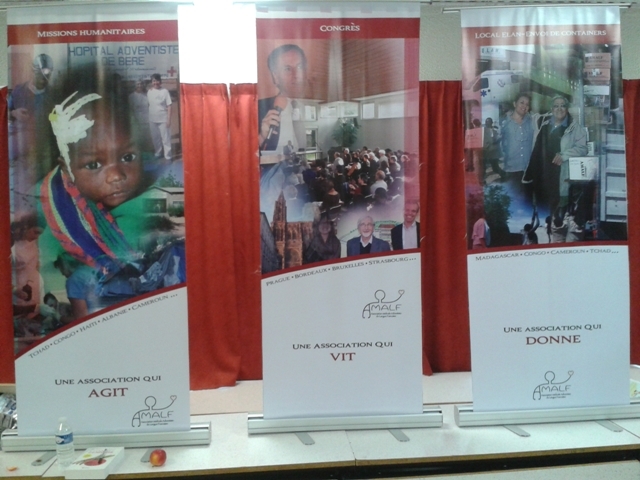 We attended the yearly congress of AMALF, which is the Association Médicale Adventiste de Langue Français. I added a paragraph about it in the definitions page of this blog. Anyway, AMALF is a group of SDA medical professionals who pool their resources and do a tremendous amount of humanitarian work in francophone (French speaking) countries. There are a number of members here at Collognes, and the family we stayed with in Avignon are members as well. 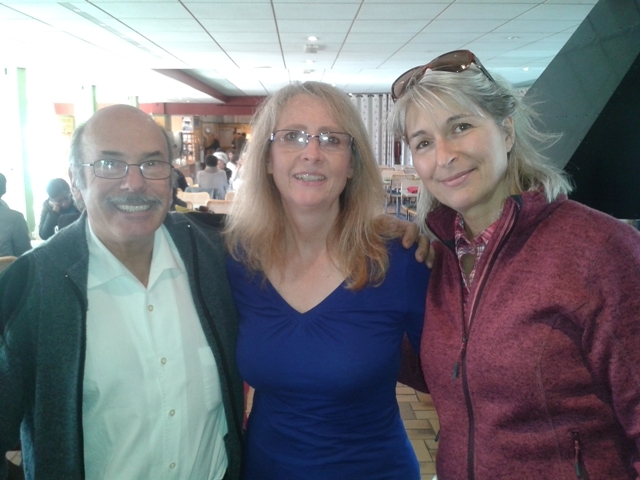 So Marc and Sandrine Kanor (the ones who loaned us the car) took us up to Valence. 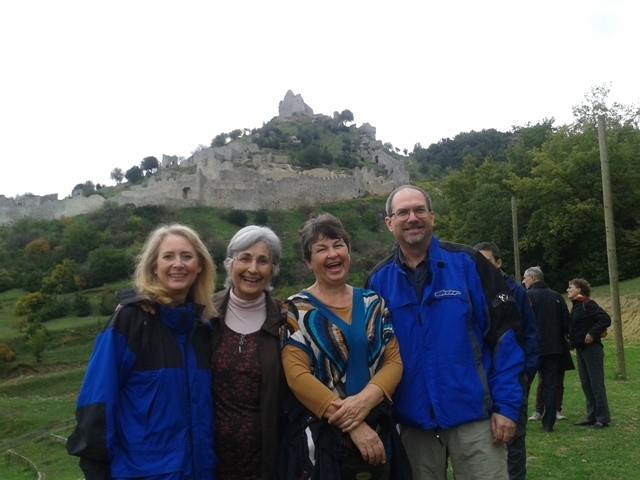 Bekki and I with Beatrice and Geneviève, with the castle looming in the background. 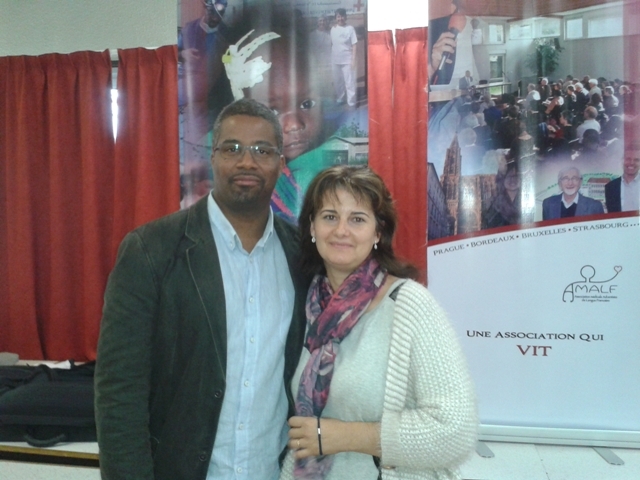 Beatrice and Geneviève were in Bere, Tchad this year working with our nephew Olen Netteburg. The weekend was great, to be brief. 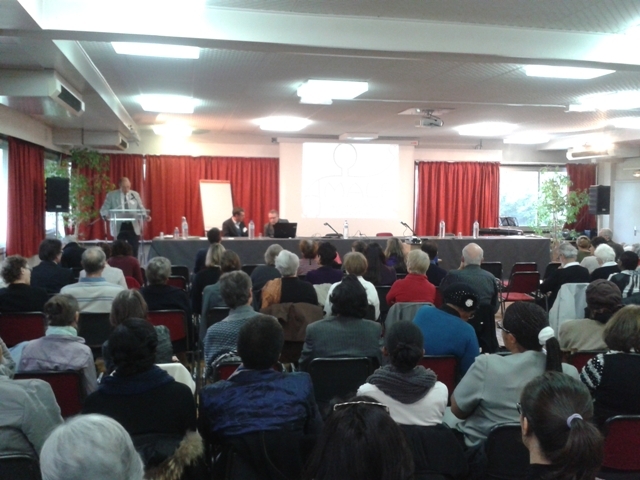 Friday was a scientific program, on nutrition and health. To be honest the doctor spoke really fast and neither of us got much out of it. But we are both really good at smiling and looking interested and acting like we are paying attention and taking notes. For the Sabbath services though, the local SDA Conference President spoke, and he spoke slow enough I could follow most of his talks, they were really good. And as always I enjoyed the singing. I have noticed that since being in France worship music has become much more meaningful. I finally figured out why. In the States I spend most of my singing time trying to sing the bass part (and doing it badly, as those who are around me can attest), and besides I have sung the songs hundreds of times, so the words are commonplace. Here I spend my time trying to figure out what the words are saying, and so I really pay attention to the words of the songs. I am doing what Virginia Deacon always tells us to do when she leads out. And you know what? The words to our hymns and praise songs are absolutely beautiful. I have been so blessed. And even the familiar hymns have slightly different words as it is not possible to directly translate between the languages. Dr. Steveny, he was the doctor in Koza in the 1980s. So what made the weekend so great you ask? What really made the weekend special were all the people we met. Friday night they had us come up front and introduced us to the group (about 150 people) and share about our mission to Koza, and AMALF has very strong ties to Koza and Cameroon. The folks at AMALF were so friendly and helpful, at meals they would help us with our French (most of them spoke English) but they would dumb down and slow down the conversation for us. Just the neatest group of people you could want to meet. 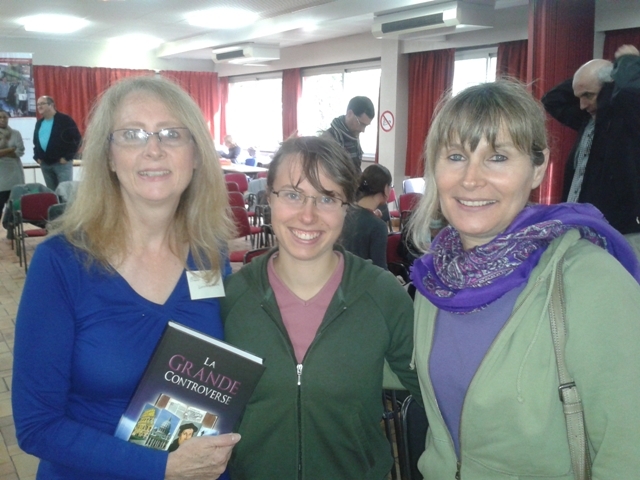 Lori and Mary who gave us a copy of the Great Controversy in French. 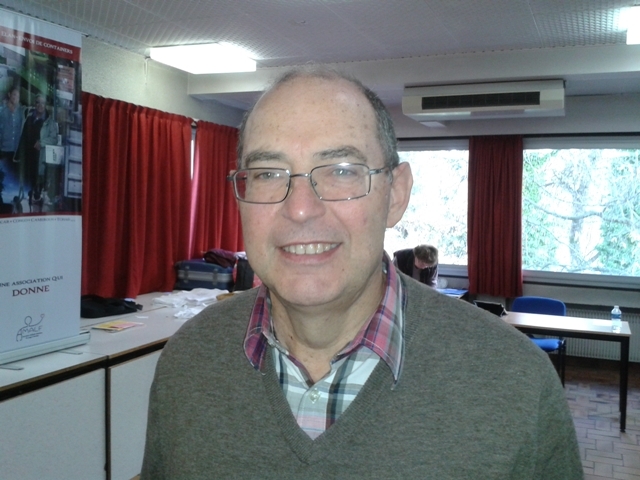 We are hoping they can help translate our blog into French. One story in particular. Saturday evening this man and woman came up to us and asked if we had an x-ray machine in Koza. We do, but we had heard that it is not working (no surprise). Well it turns out that Suzy and Rémy go to various mission hospitals in Africa and install and repair x-ray equipment. So they offered to come up to Koza next year when they are in the south of Cameroon. What an answer to prayer! A quick tourist thing. Sabbath morning when I looked out our window, I asked Bekki if she thought there was an old castle on the hill across the Rhône River. 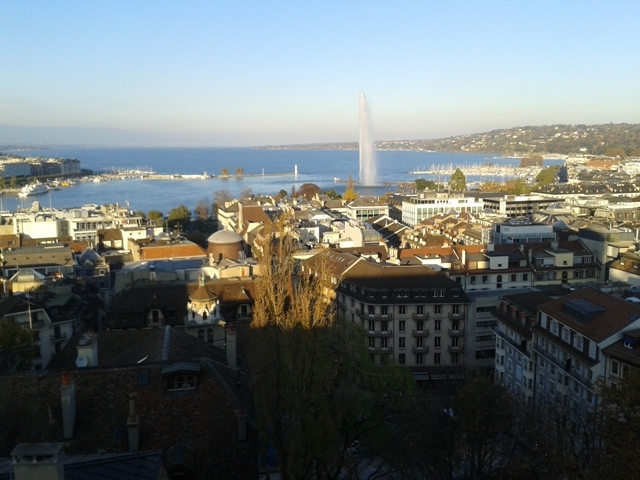 She wasn’t sure, nor was I, but that afternoon one of the excursions was a walk up to that very castle. 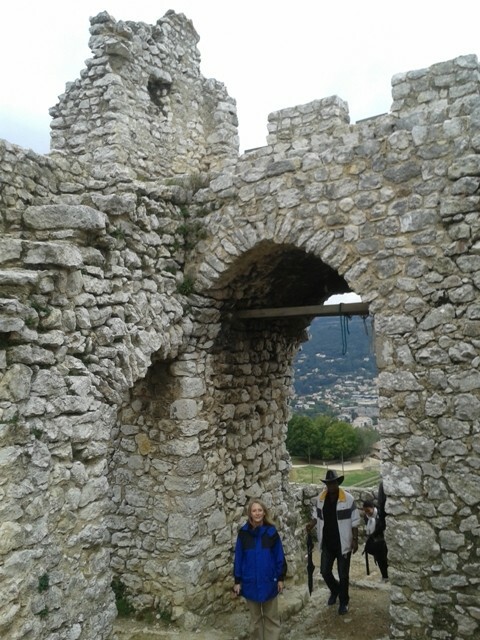 It was really cool, just the ruins of this ancient castle perched on the hill overlooking the Rhône. Not only that, we had a good Sabbath walk, and lots of opportunity to visit with our new friends. 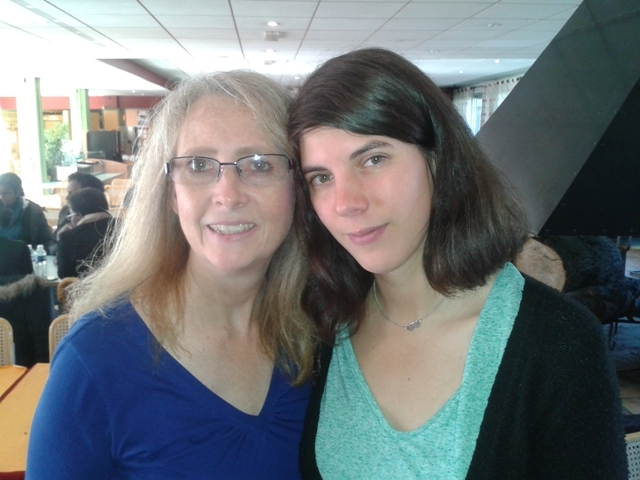 Bekki with Taiana Kempf, a last year resident in Lyon. 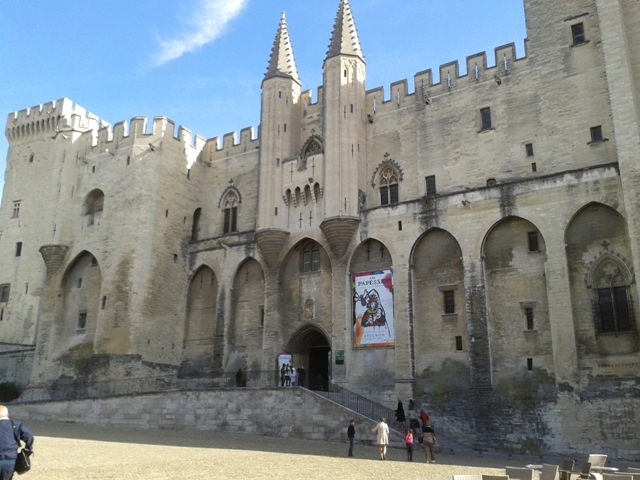 Papal Palace in Avignon, the popes lived there from 1305 until 1417. After five wonderful days in Paris with our dear generous friends Adolph and Sabine Andriamihasy and their daughters Lydie and Miriam we took the train down to Avignon in the South of France. I love those high speed European trains. We were met by Dr. Marc Kanor, a surgeon who has lived and worked in Koza and had invited us to visit with his family for a few days. So far so good. On the way to his home his wife, Sandrine, told us that we were going to stay at a small guest house at her parents home about 15 minutes from their house, and that since they couldn’t go with us to visit Avignon they were going to leave us their car and GPS and we could drive ourselves around. She said this in French and I was desperately hoping I had not understood correctly. 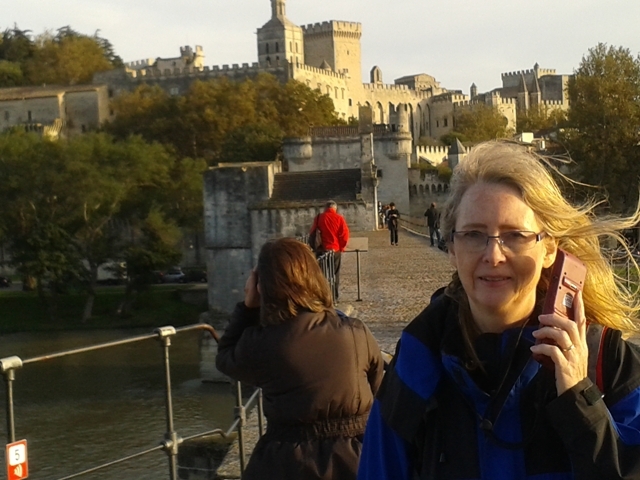 Bekki on the Bridge at Avignon with the old city in the background. My mind immediately developed a mental image of my driver’s license sitting on my desk at home in Collognes. When we got to the apartment I quickly looked through my back pack and sure enough, no driver’s license. I quietly asked Bekki if she had hers, and fortunately she did. Then I told her where mine was. That is the point in time the initial death threat was made, when it dawned on her who would be doing the driving. I say initial death threat because there were more the next day. Let’s see, when we trying to find a parking place in Avignon, driving in downtown Avignon during rush hour, on narrow French streets. And, oh yes, the time I told her to turn right onto a one way street, only it was the wrong one-way. And of course navigating the winding French streets that are two way, but only 1 1/2 lanes wide with buildings on both sides and no sidewalk or shoulder. And the car had a manual transmission. But, Bekki did a great job. We gave the car back without a scratch, dent or ticket, and I got to keep my head. I will say however, that I handled the navigation with the French GPS quite well with only a few side trips. And I was very encouraging, telling her what a great job she was doing, and no the cars were not honking at her, and yes people drive the wrong way on one way streets in France all the time, it is OK.
Marc, Sandrine and her delightful parents were gracious hosts. And the little apartment at Sandrine’s parent’s farm was very peaceful, a good break from the hub bub of daily life, and the stress of driving. as well. Avignon is a delightful city. And the old city is well preserved with about 15,000 people living in the walled section, and another 75,000 living in the rest of the city. Avignon is known for two things, it was the home to 6 French popes in the 14th century, and it is the site of the bridge of Avignon. The bridge is famous because of a French children’s song “Sur le Pont d’Avignon”, (On the bridge of Avignon) which every francophone child knows. Look it up on the internet, it is a really catchy little tune. 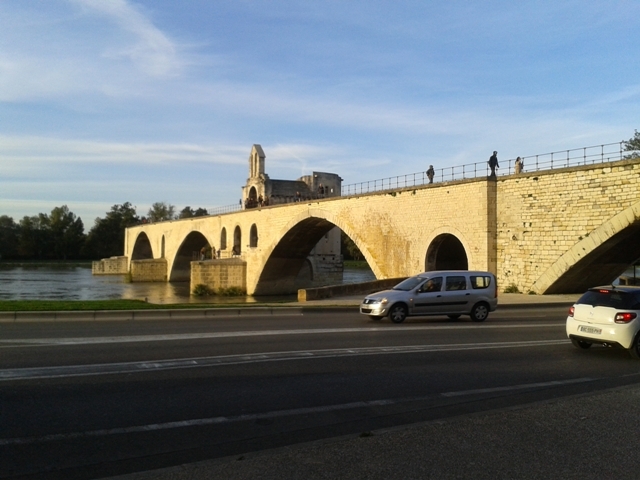 The famed bridge of Avignon, or what is left of it. 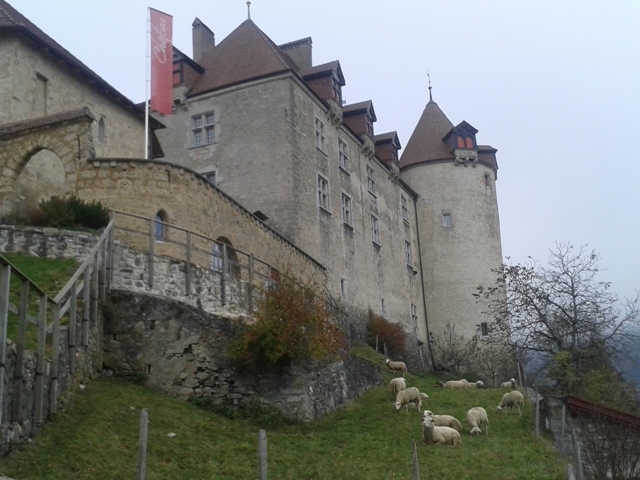 Now we are back at Collognes and ready to start our last 5 weeks of classes.